(Bloomberg) -- China’s government-backed firms are being surprisingly stingy with their cash this earnings season. Dividends from some of the country’s big payers are falling short of expectations even when profits beat. Shares of China Mobile Ltd., China Shenhua Energy Co., and oil giants PetroChina Co. and Sinopec Corp. dropped this month after their annual updates raised payout concerns. Chinese companies are doling out about 38 percent of their profits on average, down from 44 percent the previous year, according to Huatai Securities Co. While China has been telling its publicly traded SOEs to raise their payouts for years, investors had been counting on the government’s record tax cut -- which left it with a budget hole it needs to fill -- to provide a fresh impetus. But firms also plan to use a chunk of their cash to ramp up investment, a decision which didn’t sit well with shareholders counting on generous rewards. Squeezing SOEs for more money is one tool Beijing plans to use to offset the cost of stimulus this year, attracting dividend chasers to a part of China’s equity market that tends to be the most resilient in a downturn. But China also wants SOEs to increase investments: after President Xi Jinping ordered the nation’s oil giants to focus on raising domestic output, China’s big three producers boosted their combined capital expenditures to a five-year high. “Higher spending goes against the grain of what investors want,” Sanford C. Bernstein & Co. analysts Neil Beveridge and Brian Ho wrote in a note Thursday. China Mobile will stop hiking its dividend payout ratio due to uncertainty over how much it needs to spend to build its next-generation mobile network, according to Bloomberg Intelligence. Concern over how the cost of 5G will affect future dividends sent the shares down 8 percent in five days. It’s a stark contrast from the prior year, when China Mobile paid its first special dividend since 2008. China Shenhua is investing in alternative power businesses as the government’s aim to reduce pollution dents demand for coal. The company, which two years ago took the market by surprise with an enormous special dividend, missed payout estimates this time round. 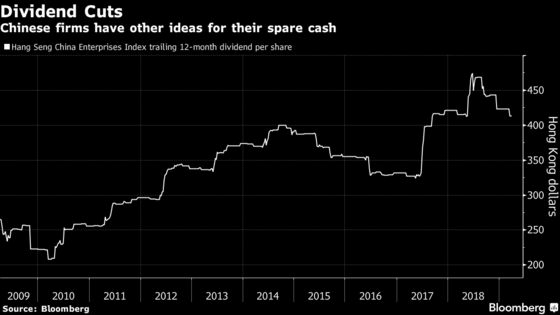 Dividends are emerging as a key lure for investors worldwide this year as global economic growth disappoints and central banks turn dovish. That’s putting pressure on bond yields and making high-yielding stocks more attractive. But in China, shares of companies that typically hand out the most cash are lagging the Shanghai Composite Index this quarter by the most since 2009. That’s after they outperformed in nine of the past 10 periods. The issue is Chinese firms still don’t pay enough to stand out. The Shanghai gauge’s dividend yield is only 2.2 percent, while investors can get about 3 percent from China’s 10-year government debt for less risk. Despite rising appetite for dividend stocks, the trade is unlikely to take off in China’s equity market after the series of dividend disappointments.